This is the first book to offer a comparative analysis of the impact of the post-war ?Baby Boom? generation on Christianity around the world. Taking a cross-cultural approach, the contributors examine ten advanced countries, including England, France, Germany, Australia, and the United States, and explore the ways baby boomers have helped reshape and redefine ?establishment religions? ? that is, the dominant, primarily Christian institutions. Their conclusions are broad and far-reaching, shedding light on the fate of religion in other countries now modernizing and those countries moving through the modern to the postmodern. Sociologists, historians, and scholars of religion will profit from the insights put forth here on religion in a postmodern context. 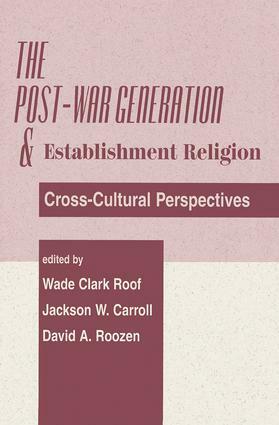 The post-war generation and establishment religion in England, Eileen Barker; baby boomers Down Under - the case of Australia, Gary D. Bouma and Michael Mason; 50 years of religious change in the United States, David A. Roozen et al; tradition and change in the Nordic countries, Susan Sundback; the post-war generations and institutional religion in Germany, Karl Gabriel; the case of the Netherlands, Leo Laeyendecker; the case of French Catholicism, Daniale Hervieu-Leger; the surviving dominant Catholic Church in Belgium - a conseequence of its popular religious practices?, Karel Dobbelaere; from institutional Catholicism to "Christian inspiration" - another look at Belgium, Liliane Voye; religion and the post-war generation in Italy, Salvatore Abruzzese; the Orthodox Church and the post-war religious situation in Greece, Vasilios N. Makrides; conclusion - the post-war generation - carriers of a new spirituality, W.C. Roof et al.